Krav-Maga was created in 1971 in Israel, by Imi Lichtenfeld, as a martial art based on the techniques and principles he taught initially in the Israeli army. Imi Lichtenfeld was born in 1910, in Bratislava. The sports and the martial arts Imi learned during his youth have strengthened his body and spirit. Then, the conflicts in Bratislava with the anti-Semitic groups allowed him to realize the difference between sports and real conflicts. In World War II Imi fought in Egypt and then, until 1948, he fought for Israel's independence. These gave him many opportunities to test the effectiveness of the techniques in real conflicts. Imi started teaching self-defense techniques in the Haganah. He developed new techniques of fighting with sticks and knives, silent techniques to eliminate aggressors without weapons etc. Later, in the 19 years of work in the Israeli army, Imi continually improved his self-defense techniques and his teaching methodology. Because of the specific of the activity in the army, Imi often had just 2 weeks available to prepare a new soldier. Thus, he had to teach a small set of techniques, which could be properly assimilated in a very short time. In addition, Imi focused exclusively on the needs of the soldiers, who from the beginning wear specified equipment, were in good fitness, had a definite purpose (to enter in the conflict zones) and the permission to use lethal force. 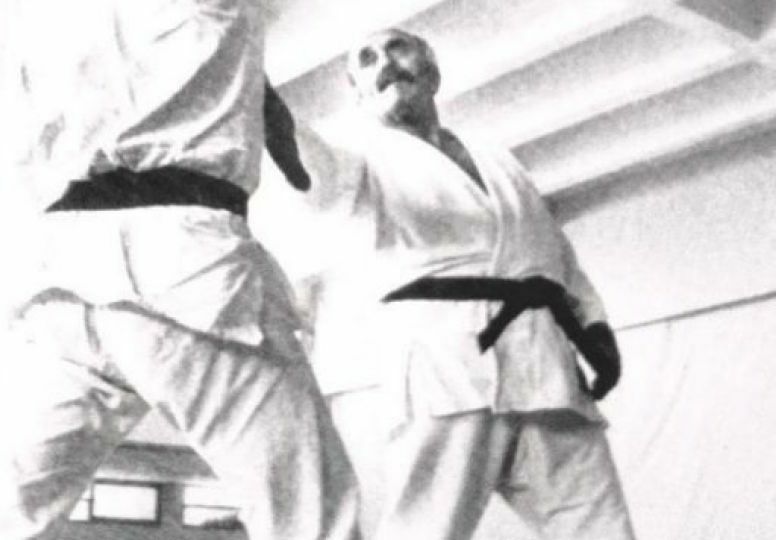 After retirement - in 196 -, Imi decided to use all the experience gained on the battlefield and in the army to create the Israeli self-defense martial art. He wanted to create something that would be useful also to civilians: regular women, men and children. They usually do not have the physical fitness of soldiers, do not carry weapons or firearms, aim to avoid conflicts and the violence that may apply is legally restricted. For that, Imi opened two training centers, one in Netanya (the city he was living in) and the other in Tel Aviv (the capital of Israel), each school with five students he trained personally. The trainings were conducted in kimono, barefoot. These ten people were the only ones who received a black belt directly from Imi. In 1971, Imi decided that his new creation is complete and only then he called it "Krav-Maga", translated as "close combat" between army corps. This Krav-Maga contains both techniques taken from the army and techniques adapted to civilians, so that an experienced practitioner can perform well in both areas. After finishing David, Michelangelo did not left next to the statue his hammer and chisel for any passerby to "improve" it. Similarly, Imi Lichtenfeld left us a legacy, which is a perfect creation that doesn't require any changes. Those who change existing elements or add new elements to Krav-Maga are doing it just because they failed to know or understand correctly Imi's creation. It's easier to change than to make an effort to learn and to practice until proper understanding. Krav-Maga does not need additions, improvements or updates. It is perfect as it was created. After retirement, Imi Lichtenfeld opened two training centers, one in Netanya (the city he was living in) and the other in Tel Aviv (the capital of Israel), each school with five students he trained personally. These ten people were the only ones who received a black belt directly from Imi. In 1974 Imi handed the management of the school in Netanya to Avikzar Eli, his best student. In 1977 handed the management of the school in Tel Aviv to Yaron Lichtenstein, the second best student of his. These actions demonstrate the full confidence that Imi had it in these two instructors! In 1978 some of Imi's students founded the Federation for Krav-Maga and Self-Defense, an association which will change its name in 1980 in Israeli Krav-Maga Association - IKMA. Because of the multiple personal interests and of the profit-oriented management of the association, both Yaron Lichtenstein and Eli Avikzar chose to leave this association. Thus, in 1982 Yaron Lichtenstein founded BUKAN School of Krav-Maga, with Imi's support. Yaron was the only student of Imi that kept unaltered its creation: the principles, techniques, training equipment and grading system. In 1987 Eli Avikzar decided to separate from Imi and the Krav-Maga Imi created and founded KAMI - Israeli Krav Magen Association. Since that moment Eli taught Krav Magen, a style derived from the creation of Imi. In KAMI were also formed instructors who subsequently opened new schools, which claim that teach Krav-Maga. Thus, Eyal Yanilov created KMG - Krav Maga Global, Darren Levine created Krav Maga Worldwide etc. After the death of Imi Lichtenfeld the number of schools and instructors who claim to teach Krav-Maga has skyrocketed. Unfortunately, many of the instructors have not received proper training and considers the name Krav-Maga as an umbrella under which thez can squeeze any technique usefull in self-defense. Also, there are many instructors who radically changes Imi's creation, continuing to keep the name of Krav-Maga for marketing purposes. Currently there are plenty of instructors and schools with different ideologies and training programs, which alienated more or less from Imi's creation. It is important to notice that of the 10's Imi's direct students only Yaron Lichtenstein continues to teach unaltered it's creation. In Romania, the KRAV-MAGA Stability in Motion school teaches unaltered the Krav-Maga created by Imi Lichtenfeld, trough László Pethő, who received his instructor diploma and black belt from Yaron Lichtenstein. There are many schools, associations and federations which by their name imply a certain representation: international, global, worldwide etc. It is important to know that there is no formal forum, widely recognized to represent and regulate Krav-Maga. As you have seen, even during Imi's life there had been three schools / different associations, whose instructors kept close contact with Imi. Imi attended to some of these schools courses and sometimes to colored belts award ceremonies. In all the pictures and movies with Imi can be clearly seen that the graduation ceremonies and the courses he attended were held in kimono, barefoot, and that the colored beltswere used. During Imi's life no one dared to spoil or alter what Imi created! Before he died, Imi named Yaron Lichtenstein as his successor and awarded him the degree of 9th DAN. However, Imi was unable to prevent the other schools and the other teachers to continue their activity. Thus, what exists in the world right now are only schools / associations / federations, smaller or larger. Their names or their spread is not relevant in evaluating the efficiency of what they teach. As you know, a well thought and implemented marketing policy can compensate for any shortcomings in the quality of products and services provided. The more an instructor or school claims that it modernizes, improves or adapts more of Imi's Krav-Maga techniques, the more they distance themselves from his creation. Krav-Maga was brought to Romania by Onn Chen, who taught the first course in Cluj-Napoca, in January 2003. Onn Chen was the favorite student of Yaron Lichtenstein, receiving from him the black belt in 1995, in Israel. Until December 2004 Onn prepared László Pethő as instructor. Since then László teaches Krav-Maga in Cluj-Napoca, initially as a representative of the Bukan school and then as the founder of KRAV-MAGA Stability in Motion school. In the school he created, László continues to teach unchanged the Krav-Maga created by Imi Lichtenfeld. In 2010 László brought Yaron Lichtenstein to Cluj-Napoca in order to train new instructors, trough 8 days long intensive courses. Later, some of them have opened new schools in different places in Romania, as branches of Bukan school. All Krav-Maga instructors in Cluj-Napoca have been initiated in Krav-Maga by László Pethő, as its students. Presently there are many schools of Krav-Maga in Romania. It is worth noting that, of these, only the schools which teaches their courses in kimono and keeps the colored belt grading system are following Imi's tradition and teach the whole and efficient Krav-Maga. We recommend you to choose yourself an instructor based on it's training and experience - the more, the better.